Outfit your kitchen with the best pots and pans money can buy today. Pick one of the top 10 best cookware sets reviewed to cook up a storm. Whether it is your first, second, or third set, you can find the right pots & pans to fit in your small to the large kitchen here. The collections made up of different kitchen utensils to cook rice, brown, meat, to preparing stew. Whatever your preference may be, we have the best cookware range to fit in with your needs. 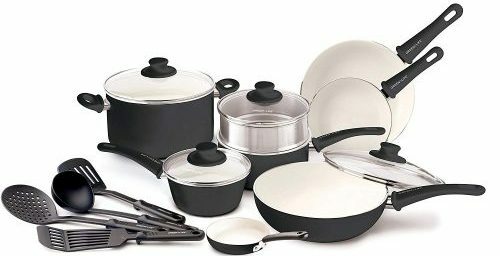 Do you want a black or multi-colored cookware sets? Look at the Vremi 15-piece collection sold at a fantastic price. The kit comprises of four pots with glass lids. Furthermore, you get two sauce/frying pans and the cookware sets nest in each other for storage. The vented glass lid you can remove and has a stainless steel rim. The pots & pans are oven safe and made with hanging handles. 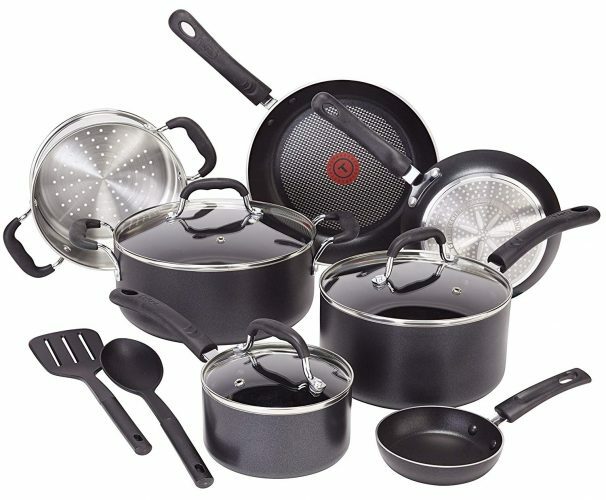 For an exceptional 14-piece cookware sets look at the T-fal Excite collection. The pan uses Thermo Spot technology to inform you when it is ready to use. The interior of the pots and pans nonstick, and it is dishwasher safe. The handles color matched for a comfortable grip, and it is oven safe. The kits suitable to use on any stove but you cannot use it on an induction stovetop. The next 15-piece cookware sets from Amazon Basics offers you a nonstick design with soft-touch handles. The kit you can only wash by hand and works with gas and electric stoves. 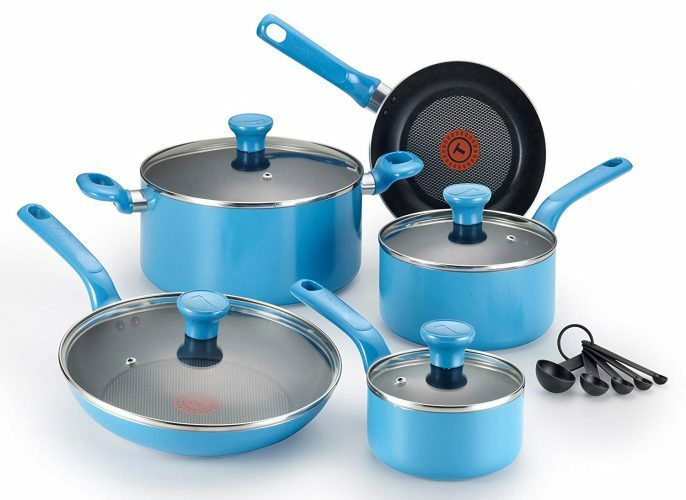 Included in the set are two frying pans, two saucepans with lids, two casserole pans with lids, and a five-piece utensil set. 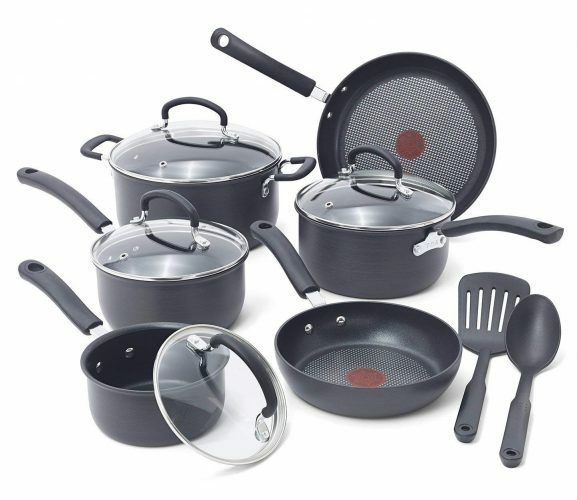 The T-fal Ultimate 12-piece cookware set has a corrosion resistant construction with the nonstick design. With the thermal spot heat indicator, you know when the pan is warm to use and scratch-resistant. The handles made of silicone and oven safe and made with an non-warp base. 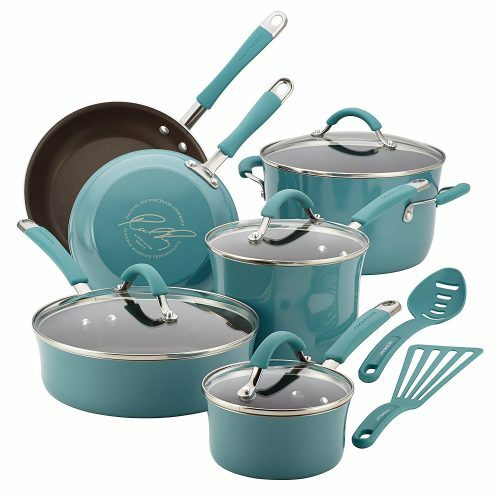 With the Rachael Ray Cucina, 12-piece cookware sets you can decide on the best color to fit in with your kitchen décor. The pots and pans constructed with aluminum and have a hard porcelain exterior with the nonstick design. The stainless steel handles rubberized, and the glass is shatter-resistant. You can use it in the oven and suitable for stovetops except induction cooking. 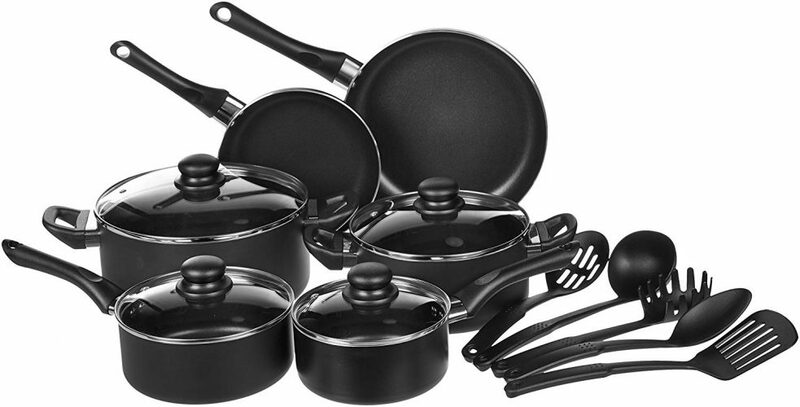 The 14-piece ceramic cookware sets from GreenLife offers you four-color styles to fit in with your kitchen. The nonstick construction provides healthier cooking, made with Thermolon Ceramic, and reinforced with aluminum. The kit has soft touch handles and suitable to in the oven and dishwasher safe. The T-fal Professional pots and pans made for induction cooking. The set comprises two fry pans, two saucepans, a stockpot, stainless steel steamer insert, one egg wonder, and two nylon utensils. The nonstick interior is scratch-resistant and safe to use with metal utensils. The handle sits comfortably in hand with the silicone structure. 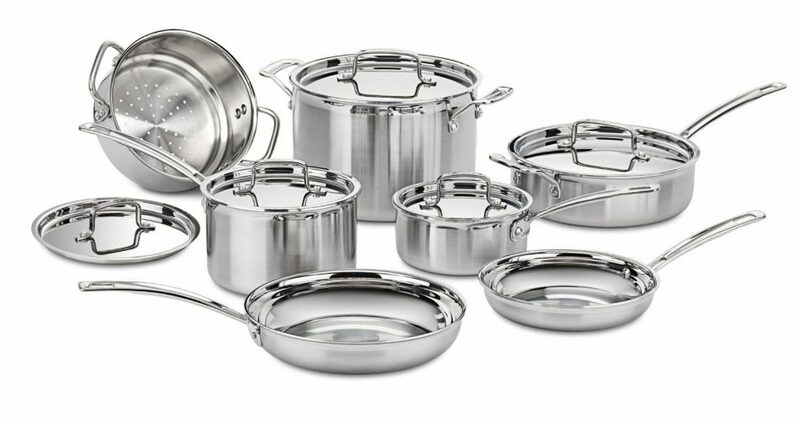 For a perfectly balanced pot and pan, nothing comes close to the 12-piece Cuisinart MultiClad set. In addition, The kit provides you with good heat distribution along the bottom and sidewalls. Also, the package has a stainless steel interior with aluminum core and smooth stainless steel outside. 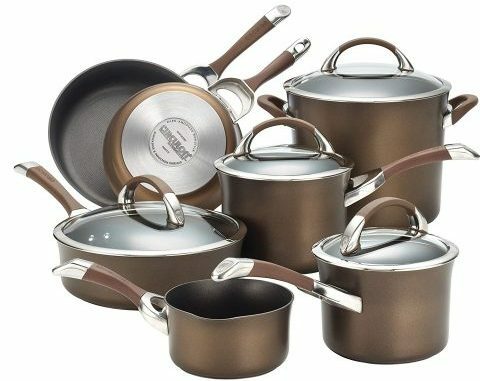 The Circulon Symmetry 11-piece cookware sets has a fantastic brown anodized design. You can buy it in other stylish shades as well and comes with a hassle-free lifetime guarantee. The pots and pans metal utensil safe and suitable to use on all stovetops. 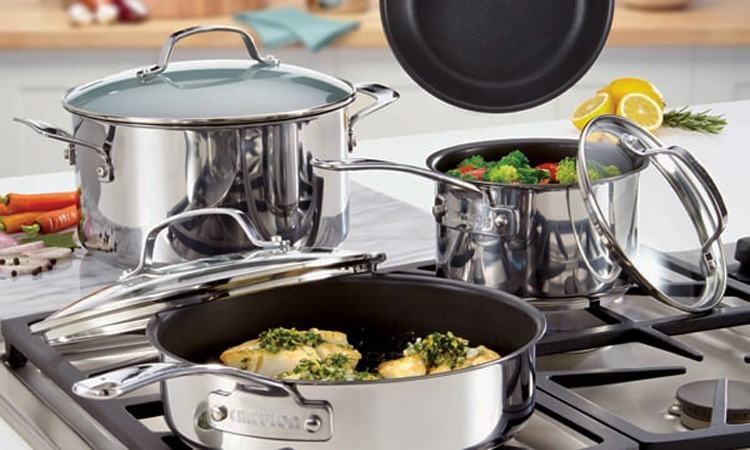 With the Calphalon 12-piece cookware sets, you get a full lifetime warranty. The aluminum construction allows for even heating and makes it durable to last a lifetime. You can place it in the dishwasher and suitable to use on most stovetops. The stainless steel handle stays cool to the touch and includes lids. 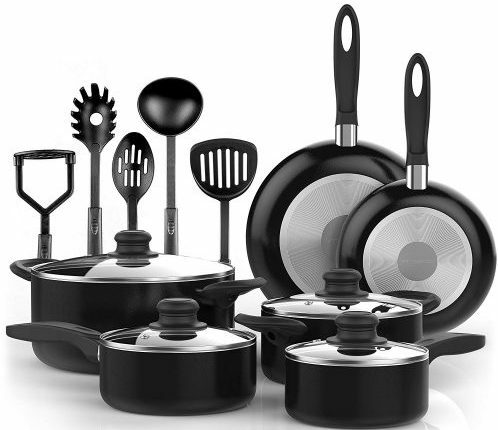 So which of the top 10 best cookware sets made for you? Do you plan to set up home or in need of replacing your old pots and pans, each of these sets can help. The kitchenware has a durable construction with nonstick design, and you can place it in the oven. Keeping it clean is a breeze with the dishwasher-safe function and all sets come with a skillet, saucepan, sauté pan, stockpot and much more.